I've criticised the KPH in the past for its prices and was pleased to note that my beer was 50 pence cheaper this visit. A good start. The pub was relatively busy and I was surprised to note that a fair number of the punters were exotic types from East London on an 'ironic' visit to the West. This curious phenomenon might be just what this part of London needs. For years now the combined efforts of RBKC and the hoards of wealthy incomers has succeeded in wiping out the quirky, lively, left-field, multi-cultural life of the area replacing it with expensive, elitist shops and cafes that none of the locals can (or want to) afford. Most of the pubs have gone and those providing live music are few and far between and are being silenced as a result of the demands for quiet being made by the wealthy incomers. 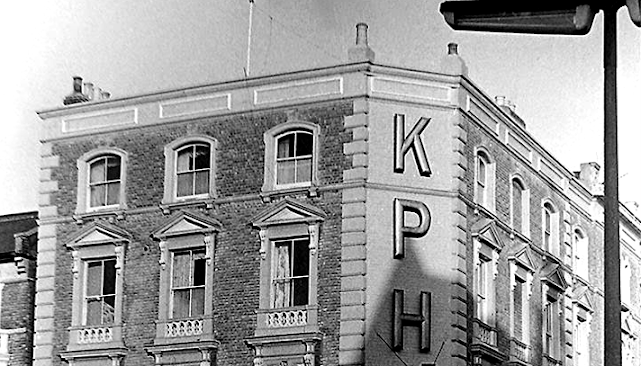 The KPH itself is being threatened with change of use to retail/residential, wiping out yet another local landmark. There is virtually nothing of a cultural nature in the area for young people; very little live music, no boozer that doesn't have pretentious of gastropubbery, no cool hangouts apart from MauMau on Portobello Road. Perhaps if the hipsters of Shoreditch continue to make visits then places for them to visit might spring up and in doing so create places for the indigenous youth to frequent. A good start would be for the KPH to be saved from the developers.